A mournful procession of about 1,500 Latvians winds its way through Riga's medieval Old Town singing traditional Latvian songs. Elderly World War Two veterans lead the crowd. And many of the participants are carrying flowers to lay at the Freedom Monument, Latvia's symbol of national independence. They have come here to commemorate those who died defending Latvia against the Soviet Union in the war. But with Russian troops now in nearby Ukraine, many in the Baltics are alarmed that history may be about to repeat itself. "If Ukraine falls, then Russian ambitions won't stop with this. I believe we will be next in Russia's list of actions," said one young man who had come to take part in the procession. "It shows the attitude of Russia - how it goes into another country very easily and acts in an aggressive manner," said another. But this annual memorial service is highly controversial. These elderly veterans fought against Russia - but for Nazi Germany. The Baltics have spent much of their history being buffeted between neighbouring imperial forces. And in WWII, having already suffered severe oppression under Stalin, many Latvians saw Hitler's forces as the lesser of two evils - Latvia's only chance of not slipping back into Stalinist oppression. But the veterans and their supporters are accused of being Nazi sympathisers - particularly by Latvia's large Russian-speaking community. About 1,000 Russian-speakers have gathered behind police barricades near the monument to protest. "Fascists go home!" shout some. "Shame! Shame!" shout others. This year security is particularly tight, with as many police officers as participants, amid fears that the instability in Ukraine will spark ethnic tensions here. It is a similar dynamic to Ukraine: pro-Moscow local Russian-speakers accusing pro-Western nationalists of being right-wing extremists. And like Ukraine, some Russian-speakers here say they are discriminated against by mainstream society. "I feel like a person who is second-class," says Aleksandr Gaponenko, a Russian-speaker who moved to Soviet-era Latvia with his parents 59 years ago, when he was a one-year-old. "We want equal rights for our languages, and we want equal social and economic rights." According to the Latvian authorities, throughout the 20th Century people from elsewhere in the USSR were resettled in the Baltics as a deliberate Soviet policy to water down Baltic culture and destroy local national sentiment. And still today Russian-speakers are sometimes pejoratively called "occupiers". So when the Soviet Union collapsed in 1991, Mr Gaponenko, like many Russians, was not automatically granted Latvian citizenship, and lost his job in Riga city council. Today he is classed as a "non-citizen" - which means he is still not allowed to work for the state and does not have the right to vote. Around 300,000 Russian-speakers, or 13% of Latvia's population, are so-called "non-citizens". And they live in an EU member state and member of Nato. To become Latvian, they have to prove their knowledge of the Latvian language and culture in a citizenship test - even if they were born here. Some Russian-speakers, such as Mr Gaponenko, refuse to take the test, saying that the country where they have spent all their lives should grant them citizenship automatically. 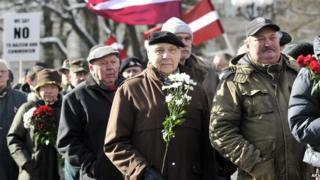 Others, particularly older people, say they do not speak Latvian well enough to pass the test. But the Latvian government says it is encouraging all residents of Latvia to become citizens. And it accuses the Kremlin of using the issue to stir up resentment within the local Russian-speaking population and create political instability. "There's massive propaganda, even an information warfare - not only here, and not only using Russian-speaking media, but also using other channels," says Latvian Foreign Minister Edgars Rinkevics. Russian-speakers often live very separate lives from their Latvian neighbours, living in different neighbourhoods, often socialising in different places. In Riga city centre, one bar might be full of local Russian-speakers, next door packed with ethnic Latvians. Estimates of numbers of Russian-speakers vary. According to Latvian pollster SKDS, Russian-speakers make up 42% of the population in Latvia, with 58% described as ethnic Latvian. This split in society is exacerbated by the political system. The parties popular with ethnic Latvian voters manage to form convoluted governing coalitions to stay in power. Meanwhile Harmony Centre, a party voted for mainly by Russians-speakers, is stuck in opposition - despite having won more votes than any other single party in the last parliamentary elections of 2011. Most problematic, says political analyst and pollster Arnis Kaktins, is that Russian-speakers often consume all their news from media produced in Moscow, while ethnic Latvians tend to get their information from Latvian or Western news outlets. So the two communities are developing opposing views about who is to blame for the crisis in Ukraine. "When so many people rely heavily on Russian news sources, it means that Russia has an instrument to change their minds if it would like to," says Mr Kaktins. There is a fear that the Kremlin could encourage Latvia's predominantly Russian-speaking border regions to follow Crimea's example and break away from Latvia to join Russia. All three Baltic States are in Nato, so it is seen as unlikely that the Kremlin would send in troops, and start a conflict that the West would feel obliged to respond to militarily. The real worry is that the crisis could increase divisions within Latvian society. Since independence in 1991, Latvia's two communities have lived side-by-side peacefully. But if the conflict in Ukraine gets worse, the rift could grow between Russian-speakers who support Russia's President Vladimir Putin, and ethnic Latvians who support the West.